Suenn Liang Electric is established in 1986, professional in custome made transformers of auto voltage regulator, single and three phase reactor, three phase power transformer, auto transformer, single phase power/auto transformer, single phase AC to DC dry type transformer and custom power transformers, etc. 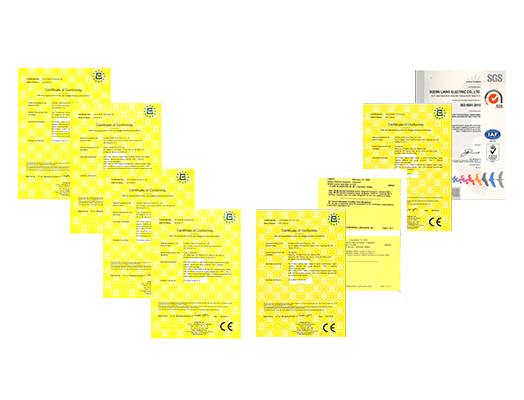 We acquired EU, UL, ISO9001, ISO9002, ISO14001 and CB inspection certification, and global certification. Suenn Liang is located in Taichung City ( Nantun District, Central Taiwan), and occupies 8300 square meters.We also cooperated with Japanese company in technology, prioritized in research & development and acquired latest equipment to provide customer from all over the world a promising product. The purpose of LVD is to make sure the low voltage equipment is safe while operating, low voltage equipment is any electronic equipment in between AC 50 to 1000 volt, DC 75 to 1500 volt. EMC = EMI + EMS, EMC is used by manufacturer to suppress the equipment electromagnetism and prevent equipment malfunctioning from interference. It is to make sure no toxic material is used during production; dispose and recycle waste material properly for environmental concern. According to the law, the material for manufacturing machinery or electronic product should not contain lead, mercury, cadmium, hexavalent chromium, PBDE, PBB since 2006 July 1st.